ALBUQUERQUE, N.M. — The U.S. Department of Energy (DOE) announced today that it’s chosen seven small clean-energy businesses to work with Sandia National Laboratories to bring next-generation technologies to market faster. 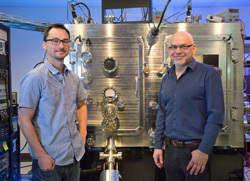 Chris Wung, left, is senior scientist, and Vladimir Matias is CEO of iBeam Materials Inc. 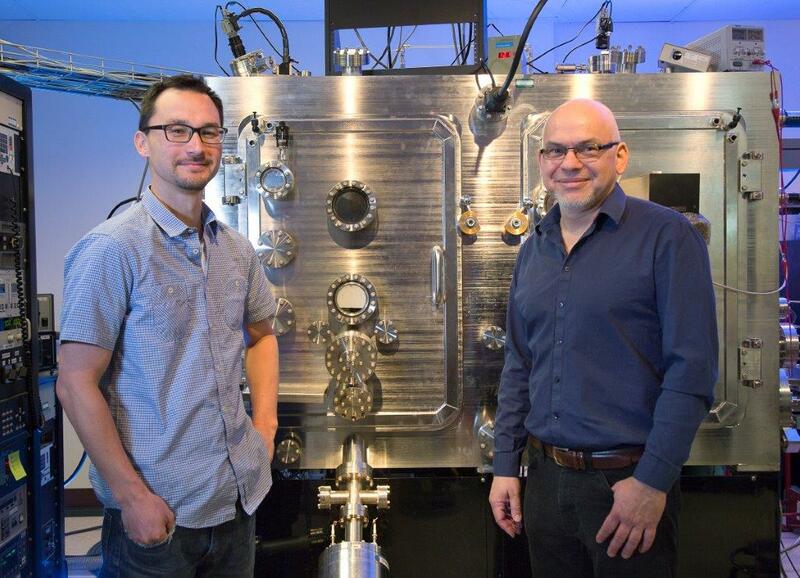 The Santa Fe company was one of seven small businesses chosen to work with Sandia National Laboratories to advance their technologies. iBeam is developing new LED products for the lighting, display and wearable electronics industries. (Photo by Sandra Valdez) Click on the thumbnail for a high-resolution image. The Small Business Vouchers Pilot was launched Sept. 23 with a website where companies could apply to receive technical help from DOE labs. In today’s announcement, the DOE Office of Energy Efficiency and Renewable Energy (EERE) said 33 of the hundreds of applicants received funding for the first of three rounds of the pilot. Nine DOE labs will participate, with a combined first-round budget of $6.7 million. Sandia’s seven vouchers total $1.62 million. The selected companies are iBeam Materials Inc. of Santa Fe; Altergy Systems of Folsom, California; FastCAP Systems Corp. of Boston, Massachusetts; Renewable Power Conversion Inc. of San Luis Obispo, California; Skysun LLC of Bay Village, Ohio; Columbia Power Technologies Inc. of Corvallis, Oregon; and Micron Optics Inc. of Atlanta, Georgia. The vouchers range in value from $150,000 to $300,000. The pilot, part of EERE’s National Laboratory Impact Initiative, aims to help small businesses by giving them access to world-class expertise and tools at the labs. The pilot will fund projects in the areas of solar, geothermal, wind, water, fuel cells, advanced manufacturing, bioenergy, buildings and vehicles. The types of projects include prototyping, materials characterization, high performance computing, modeling and simulation, scaling to generate customer samples, performance validation and regulatory compliance. Last year, DOE chose Sandia as one of five leads in the $20 million pilot, along with the National Renewable Energy Laboratory, Lawrence Berkeley National Laboratory, Oak Ridge National Laboratory and Pacific Northwest National Laboratory. Sandia was named the lead lab in the sectors of solar energy, wind energy and geothermal technologies. iBeam is developing new LED products for the lighting, display and wearable electronics industries. FastCAP’s technology powers downhole tools operating at extremely high temperatures, from 150 to 300 degrees centigrade. Renewable Power Conversion seeks to advance its macro-micro inverter technology for commercial and utility-scale photovoltaic power systems. Skysun will do systems modeling to better understand the performance of its prototype for an array of heliostats controlled by a single mechanism. Micron Optics is working on integration of fiber optic systems in commercial wind turbines. Columbia Power Technologies is developing a proprietary system that converts ocean waves into cost-competitive, utility-scale electricity. Altergy Systems will further develop its fuel cell technology for backup power in remote, mission-critical areas. Two more rounds of competition will be offered to small businesses in 2016. To be eligible, businesses must be U.S.-based and -owned with no more than 500 full-time employees worldwide. Companies can apply to Sandia through the SBV website for $50,000 to $300,000 in vouchers that can be used for a variety of technical services. Successful companies will be required to provide a 20 percent cost share or in-kind services.